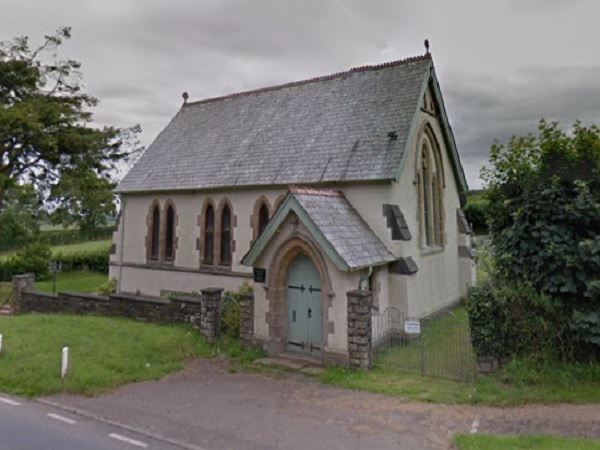 Merrymeet Methodist Chapel – Menheniot, Cornwall. Meaning ‘Sanctuary of Neot’, Menheniot is a civil parish in the county of Cornwall. Within that parish lies the tiny hamlet of Merrymeet. The existence of the village is without doubt linked to the mining industry. Historically Cornwall has always had a rich mining heritage since tin was discovered here more that 2000 year ago. Other metals including gold, silver, copper and zinc were also mined albeit on a much smaller scale. 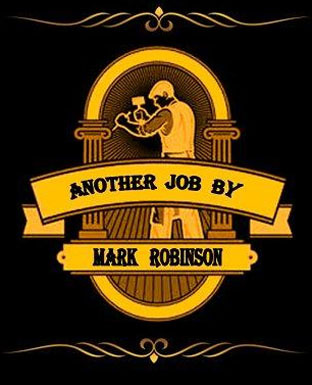 Then, in the 1840’s, a large deposit of copper was discovered in the Caradon area and great fortunes were made. Two brothers, Peter and James Clymo were the most successful and around the same time deposits of lead were discovered in the parish of Menheniot. The two brothers set up lead mines and so the village of Merrymeet was founded after the Treweatha lead mine started it operations here. Between 1852 and 1872 Treweatha produced 4371 tons of lead and 134,000 ounces of silver. The mine itself had two shafts with the deepest being 600 feet. 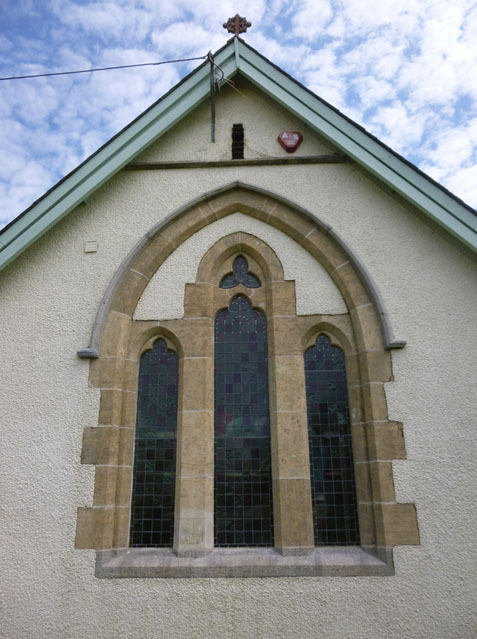 The community of miners brought with them a strong religious following to the village and required a place of worship so a chapel was built at Trengrove, this fell into disrepair, and was replaced by a new one in 1910 at Merrymeet. This was converted into residential use in about 2010. 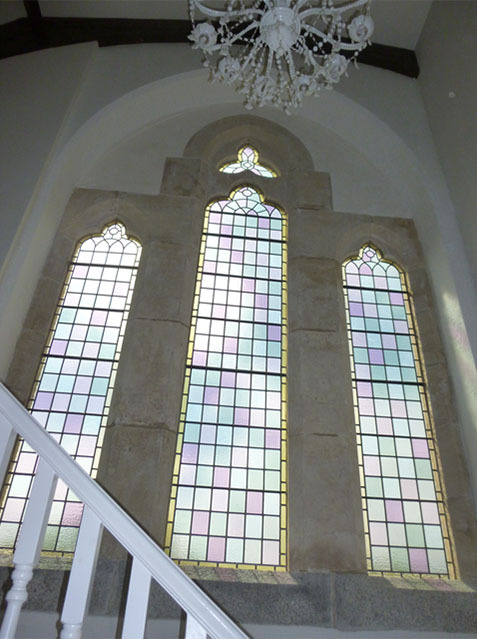 We were contacted by the owners who asked us to resolve a problem they were experiencing which involved damp penetrating through the stonework around one of the windows. 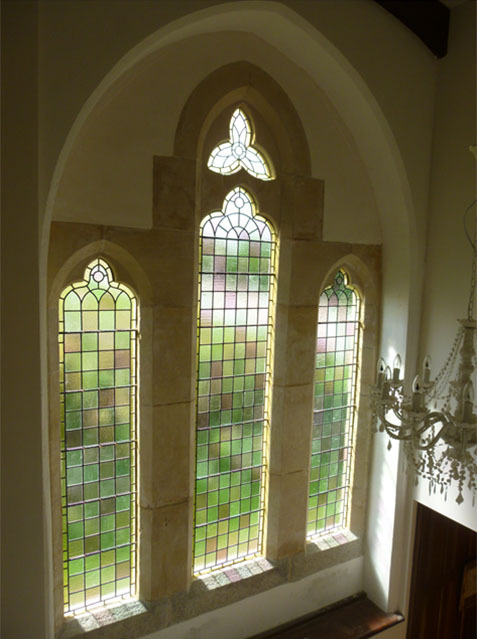 The window in question consisted of three Gothic style lancet windows on one of the gabled elevations. 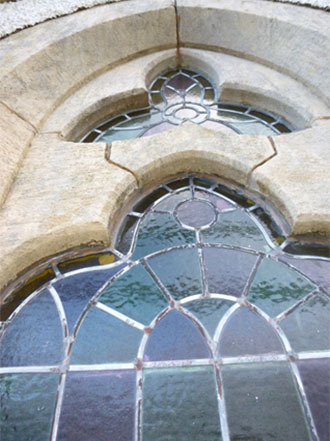 Lancet windows are tall and narrow with a pointed arch at the top and its names derives from the fact that it resembles a lance. 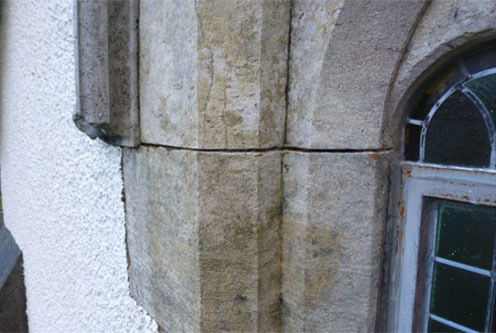 Porous stone, previous repairs that had been carried to a poor standard and open defective pointing were all contributing to the damp problem. 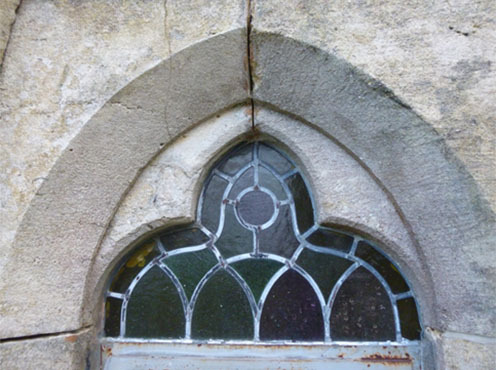 The lead work to the leaded lights were also in a poor condition and during heavy rain fall water was getting through the glass to the inside. 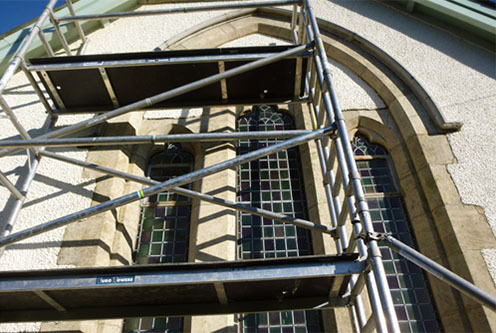 After setting up a tower scaffold we first pressure washed the stonework around the windows and then carefully cut out all the pointing to the joints. 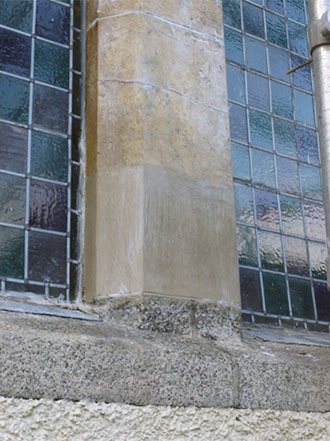 We cut out and prepared a previous cement based repair that had been carried out to a poor standard just above the granite sill on one of the central mullions. 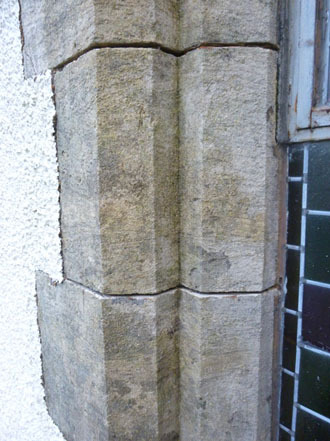 This we replaced with a lime based repair mortar to match the colour of the existing Beer stone. Beer stone itself is a soft stone when first quarried which hardens in time and favoured for cutting and shaping detailed shapes in stone. We also repaired a section of the label / hood mould which went around this window and then we repointed all the joints that had been cut out and prepared previously. 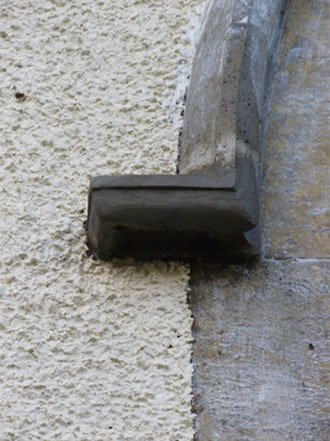 This was pointed in using the same lime based mortar which was used to carry out the Beer stone repair. 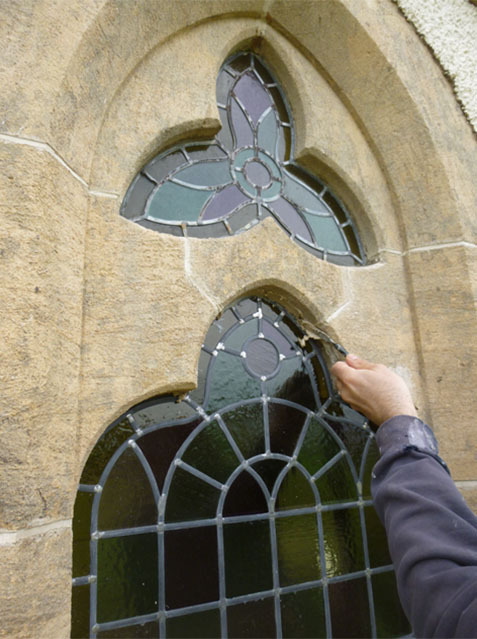 Once the pointing was completed we coated all the stonework around the windows including the label mould with a product called “Dryseal”. This is a penetrating masonry cream that when applied to porous stonework it becomes an integral part of the substrate creating a colourless, waterproof membrane after it dries. It also has insulating properties. 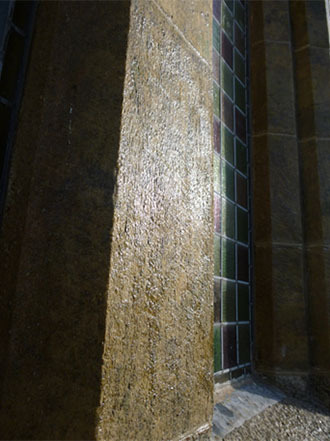 More importantly it lets the stone breathe whilst letting moisture out but not letting any in. All in all we gave the stonework two coats and it is a good system to use in these circumstances. 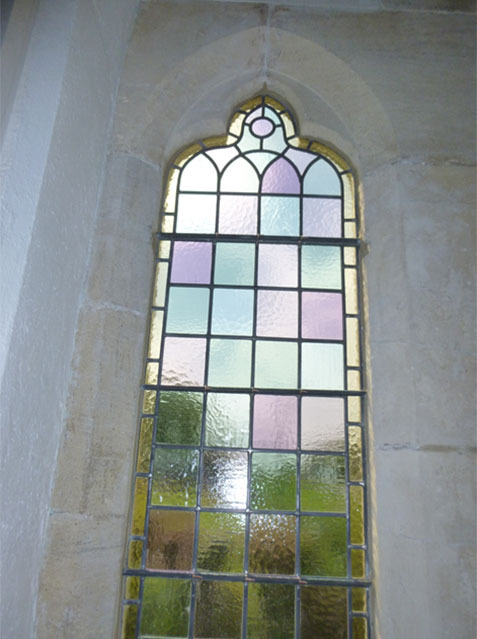 After we had carried out the repairs the glass leaded lights were taken out as they were letting in water too. 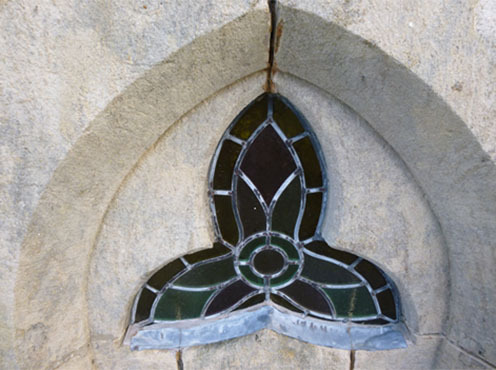 As much of the original glass was salvaged and the three windows were completely remade with new lead by a company called “The Glassery” based in Saltash. After they were fitted back into place we went back to point in around the new windows both inside and out with a lime putty mortar. All the work that was carried out solved the problem of the penetrating damp.